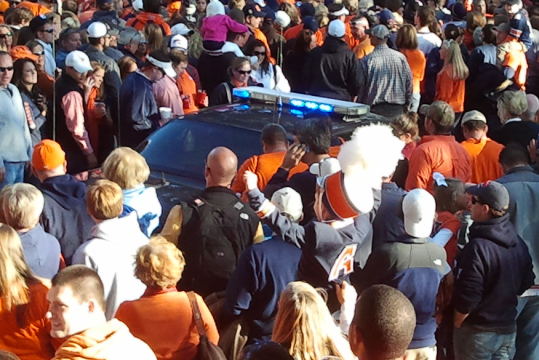 Saturday’s Tiger Walk was apparently all kinds of dangerous. It was about 15 minutes til 4, so it was completely solid people at that point. From my left, a Mississippi State Trooper leading a black fancy car came by trying to drive through. He did the whole ‘flash his lights’ thing to try to make people move out of the way. Before he actually crossed the intersection, he was able to drive a little. Everyone is standing around, ‘Where is he trying to go?’ The MST pressed on, although it looked like an ocean of people, he kept trying to drive. Even though this put a lot of kids at risk, in my opinion, he just kept trying to drive through. The fancy black car turned around before he drove into the solid sea of people. After the MST crossed Heisman and got about 100 feet (I’m guessing there) he either had someone tell him he was in the wrong place or he realized it was fruitless, so he backed up. In the middle of ALL of those people, he backed straight up until he recrossed Heisman (backwards) and got back in front of where we were standing and turned around. In about 5 mins, the Ole Miss team buses pulled in (on the other side, where they were supposed to be) and drove straight into the stadium. We guessed that the MST was supposed to drive in the stadium with the team but made a wrong turn. 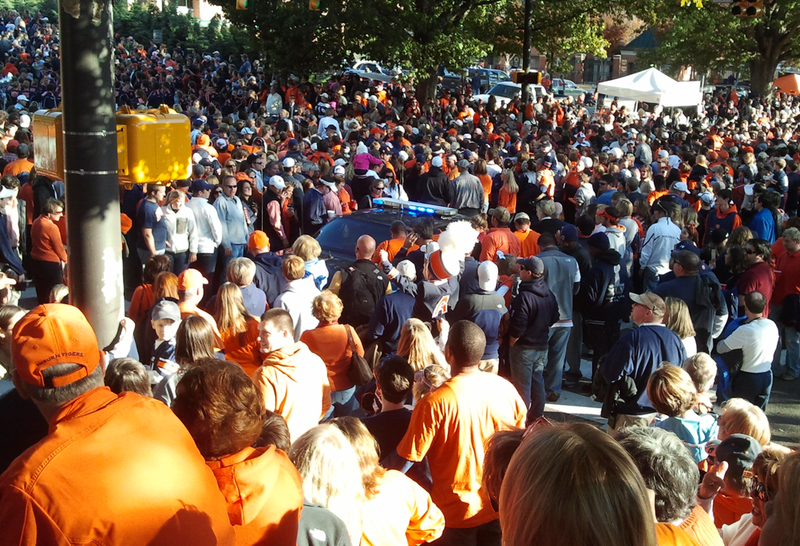 I have no problem with mistakes, but when he saw the sea of people, he should have consulted game day info and realized he was in the wrong location. In my opinion, he put a good number of people in danger. It sounds a lot milder in description than it was. Drunk dudes groping players, state-sanctioned vehicular homicide, dogs and cats living together, MASS HYSTERIA! Saw that. It was an error in judgment if nothing else. And when he got in, he had nowhere to go of course. Good-natured bystanders and the patience of the trooper prevented any injury. Backing up through that crowd must have been nerve-wracking.